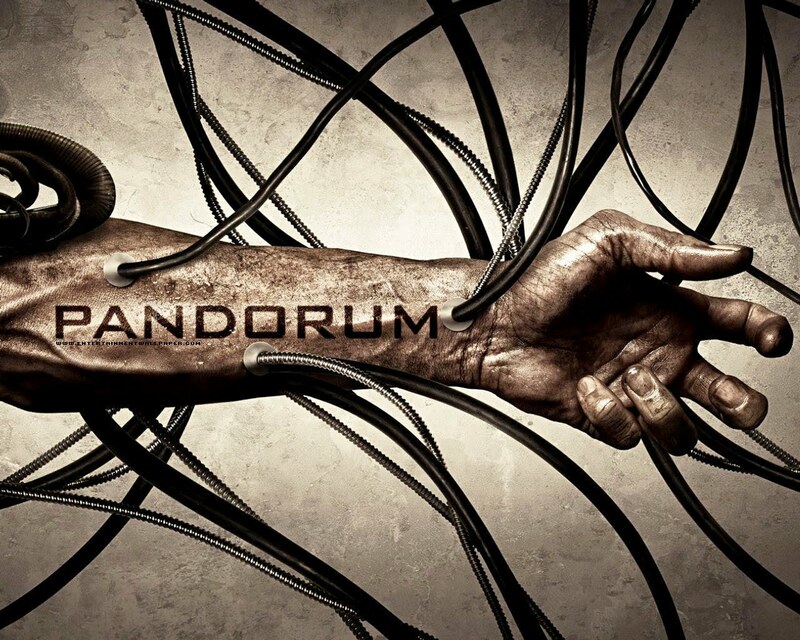 "Pandorum is a German-British 2009 science fiction horror film, with elements of Lovecraftian horror, and survival adventure. The film was directed by Christian Alvart and produced by Robert Kulzer, Jeremy Bolt and Paul W.S. Anderson. Travis Milloy wrote the screenplay from a story by Milloy and Alvart. It stars Dennis Quaid and Ben Foster. Filming began in Berlin in August 2008. Pandorum was released on 25 September 2009 in the United States, and on 2 October 2009 in the UK. The film's title is a nickname of a fictional psychosis called ""Orbital Dysfunctional Syndrome"" (ODS for short) caused by deep space and triggered by emotional stress leading to severe paranoia, delirium, and nosebleeding. The film received mixed to negative reviews, but had gained a cult following over time." "In 2174, the human population has exceeded the carry capacity of Earth, leading humanity to build a huge interstellar ark named Elysium. Its mission is to send 60,000 people on a 123-year trip to establish a colony on an Earth-like planet named Tanis. The passengers and crew are placed in hypersleep, with a rotating crew who awake for shifts of two years each maintaining the ship throughout the journey. Eight years into the mission the ship receives a transmission from Earth in multiple languages: ""You're all that's left of us. Good luck, God bless, and godspeed."" Some unknown time later, two members of the flight crew, Corporal Bower and Lieutenant Payton, are awakened from hypersleep. Improper emergence from the hibernatory state leaves them both with partial amnesia. The ship is experiencing power surges caused by an unstable nuclear reactor, which leaves them unable to enter the bridge, although they have steady power in their quarters. Bower ventures into the seemingly abandoned ship using the ventilation system with the intention of stabilising the reactor in case it goes critical. After suffering panic attacks from his claustrophobia he begins to suffer symptoms of ""Orbital Dysfunction Syndrome"", nicknamed ""Pandorum"", a severe psychotic illness known to appear in deep-space travellers causing delusions, paranoia, hallucinations and violence. It is known to have once caused a captain to send his entire crew to their deaths due to being convinced that the mission was cursed. Bower encounters Nadia, a former geneticist and Manh, an agriculturist, and they are attacked by a group of cannibalistic pale-skinned humanoids with heightened senses of smell and strength and a seemingly tribal culture. Bower's group flees into a barricaded chamber and finds a cook named Leland, who has been awake for years, living off the water leaking into the ship, the algae it creates, and resorting to cannibalism. Meanwhile, Payton encounters a strange young man named Corporal Gallo, who claims that the ship is lost in space and that he had to kill his rotation team in self-defense because they developed Pandorum after finding out that earth mysteriously vanished. The creatures are initially assumed to be transformed passengers, but Leland invites Bower's team to dinner and shows them mural drawings depicting their true origin. According to Leland, early in the mission Gallo developed Pandorum, as did the many passengers that he then brought out of hypersleep early. Taking advantage of their mental state, Gallo then convinced these insane passengers to exile themselves to the ship's enormous cargo hold to play a cruel cat-and-mouse game of survival which involved fighting, capturing, torturing, and eating each other. Eventually Gallo went back into hypersleep, leaving the descendants of the psychotics to evolve over the course of successive generations (accelerated by an enzyme produced in the hypersleep pod's feeding tubes), becoming a troglofauna species that now roams the ship, with Gallo's savage game becoming the centre of the mutated humans' culture. Bower hopes to find his wife on the ship before the creatures do, but later his memories come back to him and he remembers that the woman he is looking for divorced him and stayed on earth, disappearing along with the rest of the planet. This reveal almost makes him give up on the mission and helps push him closer to insanity. When Bower's group finds the reactor, they also find that it is the lair for a large community of the humanoids. Bower fails to make a stealthy approach, and Manh acts as a distraction while Bower restarts the reactor, killing most of the humanoids. Leland flees, and Manh is cornered by their leader, who challenges him to single combat. He defeats the leader, but then is killed when he hesitates to slay a humanoid child afterward. With the power restored, Payton can finally access the bridge, but Gallo assaults him to prevent him going. Gallo injects Payton with a sedative, but suddenly disappears, leaving Payton holding the syringe in his own hand. It is revealed that ""Payton"" was hallucinating his younger self and that he is in fact Gallo. Gallo opens the shutters on the bridge's windows, revealing that the ship is apparently adrift in deep space with no stars visible. The revelation is the final stress that causes Bower to slip fully into Pandorum. Gallo takes advantage of Bower's mental state and tries to convince him that they must maintain the violent society that has developed on the ship rather than attempt to revive civilization, since that is what led to the overpopulation of Earth. However, what Gallo's hallucination said about the ship being lost in space was a red herring. As Nadia observes bioluminescent ocean life through the windows, and the computer displays that 923 years have elapsed since the mission launched - 800 of which the ship has spent stationary and underwater after arriving at Tanis and automatically landing itself in the ocean. Gallo attacks Bower and Nadia, and Bower suddenly hallucinates humanoids invading the bridge. In his delirium, Bower smashes a window and water pours into the ship, drowning Gallo and all the remaining humanoids. Nadia manages to snap Bower to reality, and they climb into a hypersleep pod. The flood triggers a hull breach emergency-system which automatically ejects all active pods (theirs as well as those of surviving colonists) to the surface. Bower and Nadia surface near a lush coastline, and witness the other pods ascending one by one. Thus begins Year One on Tanis, with 1,213 survivors from the original 60,000 humans." hi admin.. appreciate if you could reupload the movie..